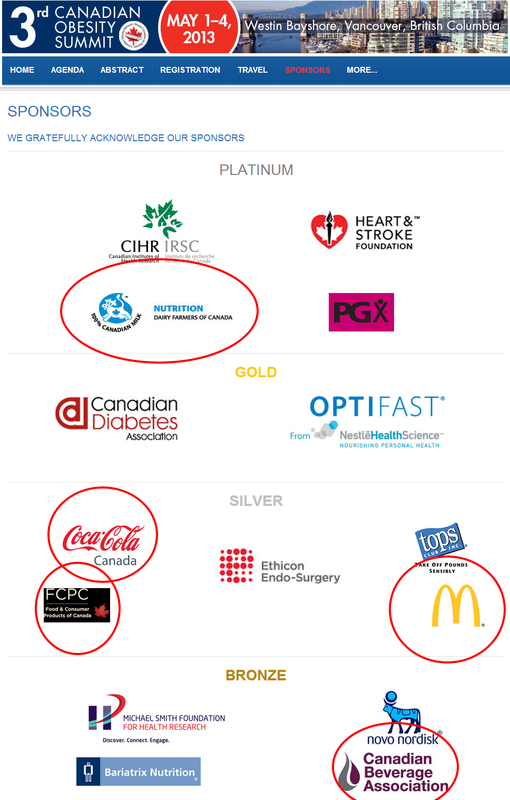 Among this year's sponsors of the Canadian Obesity Network's Scientific Summit are Dairy Farmer's of Canada ($30,000), McDonald's ($10,000), Coca-Cola ($10,000), food industry front group Food and Consumer Products of Canada ($10,000), and the Canadian Beverage Association ($5,000). I'm sure it won't come as a surprise to any reader here that I think these partnerships are ill advised. "to act as a catalyst for addressing obesity in Canada and to foster knowledge translation, capacity building, and partnerships among stakeholders so that researchers, health professionals, policy makers, industry and other stakeholders may develop effective solutions to prevent and treat obesity." Where I struggle today is that CON is no longer simply a networking tool. Due to the tireless hard work of its team and members, over time, CON has become so much more than a network. Today CON serves the public, the media, and policy makers as Canada's go-to organization for opinions, ideas and support on matters pertaining to obesity's treatment, prevention and policy interventions. CON has very much become the public face of obesity in Canada, and events like the Summit and the many practical workshops CON puts on throughout the year are not simply geared for networking, but rather for education, and do undoubtedly help to steer this country's course in dealing with this issue. As a further testament to just how important CON has become to obesity policy in Canada and just how far it has grown from a simple network, if there were a federal or provincial program focused directly or indirectly on obesity that CON was not somehow involved in as an adviser or participant, I'd honestly be shocked. It's these hard earned roles outside of networking that give me pause with CON's food industry partnerships,. While there's a great chance that most CON members would never think that they themselves might be influenced by taking money from industry or by attending food industry sponsored events, research on both food and drug industry involvement and sponsorship suggests the contrary to be true. Remember too that conflicts of interest are defined simply by the potential or the perception of a conflict. Among the many potential risks of the food industry sponsoring CON's Scientific Summit, consider whether or not reliance or acceptance of food industry dollars might impact upon CON or CON's members abilities to speak forcefully and critically on issues such as mandatory menu board calories, soda taxes, advertising bans, or cup size bans, or whether consciously or unconsciously food industry partnership and reliance will water down, limit or influence opinions therein? Unfortunately, there's no doubt these conflicts of interest sully CON and its members' reputations and scientific authority - a fact made clear to me by the many emails of concern and disdain that I've received from both individuals and organizations who independently discovered the Summit's sponsorship page and Coca-Cola and McDonald's involvement. "Can a Beverage Company Make a Positive Difference in the Fight Against Obesity?". "If we are really honest with ourselves, we know that no one group or sector can solve this problem alone and searching for a silver bullet that miraculously stops obesity is just not realistic. Targeting scapegoats or pointing fingers is simply a waste of energy." And here's betting Dr. Applebaum doesn't bring up the multi-year advertising campaign specifically targeting children that Coca-Cola announced yesterday which will include co-branding with their 16oz and 20oz bottles. Were CON simply a networking organization, while I still would be unhappy with food industry sponsorship, I likely wouldn't have felt compelled to pen this post. But given the important and substantial role CON has so rightly earned for itself as a leader in Canadian research, policy, education and discourse on obesity, I think these sponsorships sell short CON, its membership and the public.